Since a few months now, the company Belkin sells several home automation devices under the brand WeMo. 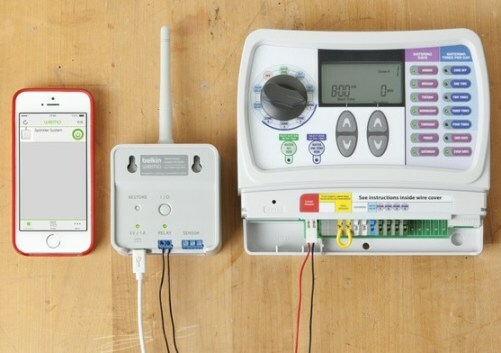 Today, the manufacturer announced the WeMo Maker solution, a customizable system that allows you to control and monitor any electronic low voltage equipment from a smartphone or a touch pad. Today, most home automation systems have trouble talking between different brands. Also, should be equipped with devices from the same manufacturer to ensure compatibility and full use. Well-defined universal standards are slow a bit to democratize. Remains, however, that the Belkin Corporation has announced WeMo Maker. This device can connect to any device controlled by a low voltage switch to allow starting, stopping or events programming. The WeMo Maker can connect to a wide range of 5V sensors such as light sensors, motion, humidity, temperature, flame, CO², etc. In addition, it is compatible with the IFTTT service that begins to be integrated by different manufacturers in the field of home automation allowing access to services, Internet applications. The WeMo Maker solution is available for €80 approximately.